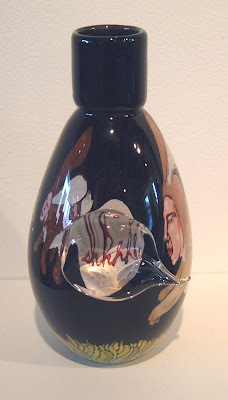 I just received a package containting an amazing assortment of hand painted hand blown works by glass goddess Tanya Zaryski! 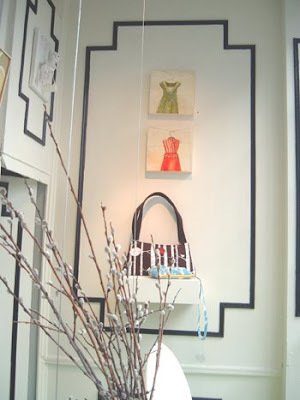 I first fell in love with Tanya's work while vacationing in Woodstock, VT this past winter. 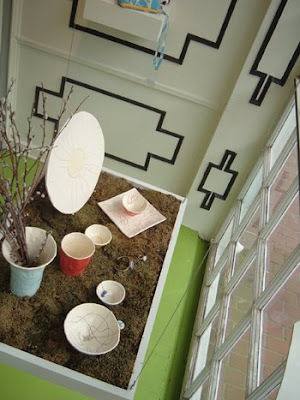 "I have always considered myself an image-maker, and a decorator of surfaces. 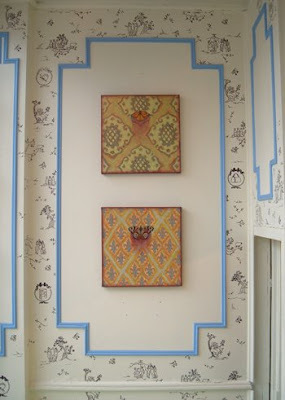 Attracted to the highly colored and densely populated surfaces of folk art images, textile designs, and ancient enamelled glass ware, I have striven to create the same "look" but in the context of my own experiences. Rows of town houses replace traditional abstract borders, and familiar faces stand in for figures of mythology." In many of the pieces, Tanya has added remnants of spoken/written words (the "Speak" series). 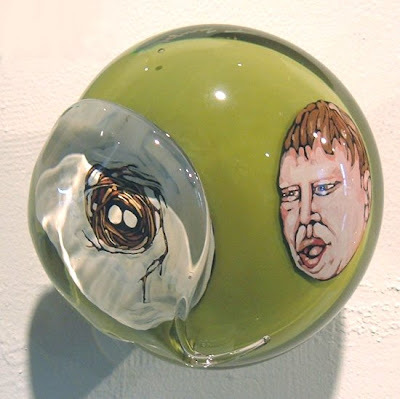 "Some faces utter words, distorted by molten glass overlaid in the comic-like speech bubbles, others speak in images. 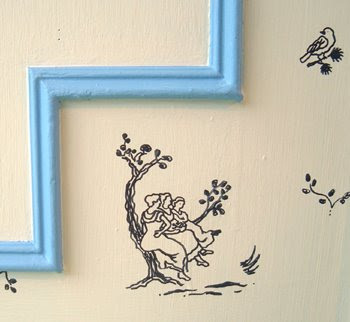 Bits of conversation, nonsense words and poems are painted deep within the glass." 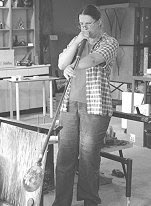 Tanya began her art training at the University of Toronto, studying art history, painting, drawing and sculpture, before discovering glass blowing at Sheridan College. 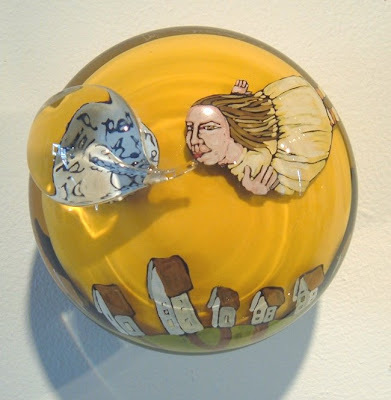 She completed three years working as an artist-in-residence at the Harbourfront Glass Studio in Toronto. 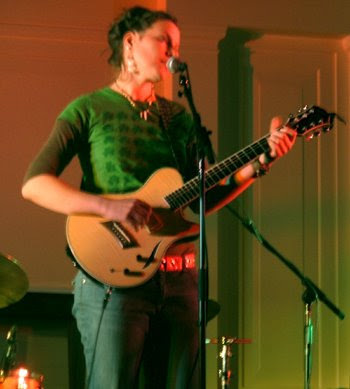 She currently lives with her partner Mark Lewis, and their young son on a farm in the Beaver Valley near Georgian Bay (Canada). After 18 months of renovating, they have completed work on their century barn, creating a functioning hot glass studio and gallery space (Beaver Valley Glassworks). 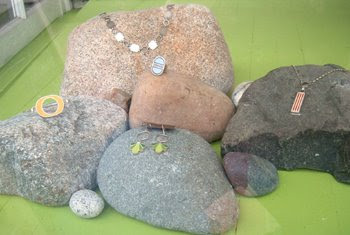 More of the works that are now available at Three Graces can be seen here. The postcards just arrived for the next show! 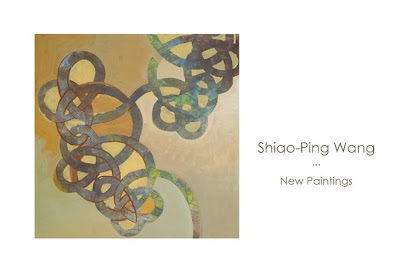 "Shiao-Ping Wang: New Paintings" opens next Friday, May 9th! A sneak preview of some of the new works can be seen here. My love for this little city by the sea grew stronger this weekend with the celebration of the New Hampshire Folk Festival and Jazzmouth! 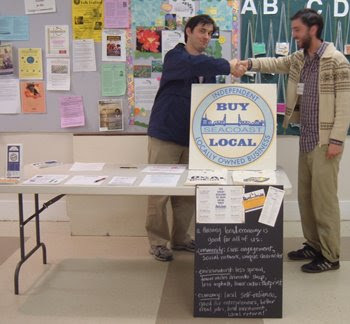 I am a proud member of the "Buy Local" program here in Portsmouth. 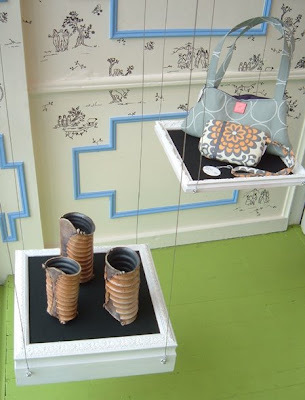 The Seacoast Buy Local campaign highlights the connection between shopping at locally owned, independent businesses and retaining our community's distinctive character. 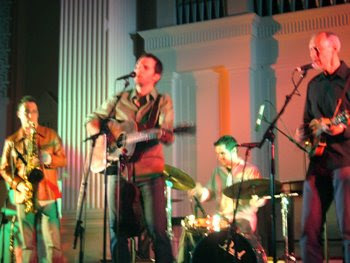 Cuzin' Richard invited us to have a table at the Folk Festival. Bob and I represented; we had many interesting conversations with people regarding the importance of buying local as it is better for our community, our economy and the environment. 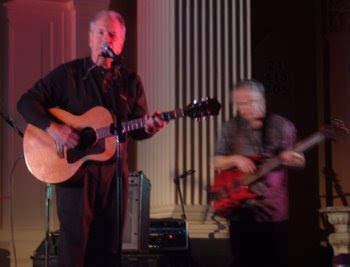 The Folk Fest was held at the South Church on State Street and featured three great perfomers: Antje Duvekot, Cormac McCarthy and the Jake Armerding Band. After the concert we headed over to the Press Room to catch the tail end of an amazing performance by Jazz great Sheila Jordan with the Harvey Diamond Trio. Wow, I can't believe an entire month has gone by since my last post! I've been a busy busy bee...I took an inspiring trip to Boston a few weeks ago where I spent most of my time admiring various window displays, I came home with lots of ideas and got right to work!